This is one of a distinctive group of enamels produced for the Court from some time shortly after the construction of the Guyue Xuan for the Qianlong Emperor in 1767 until the Emperor's death in 1799. Some of the Guyue Xuan group were produced at the Palace workshops, including this example, while others were made elsewhere, probably at Yangzhou (see lots 610 and 690). Among the Beijing products is a small group on mostly earlier colored glass bottles made at the Imperial Glassworks which include Imperial yellow and sapphire-blue versions. This is a rare example on a caramel-colored ground. See another example on caramel-colored ground, formerly from the Mack Collection, and now in the Denis Low Collection, More Treasures from the Sanctum of Enlightened Respect, p. 18, no. 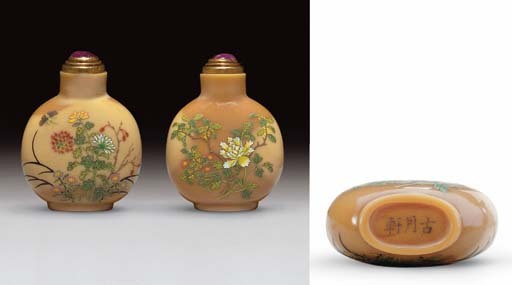 15, which is also attributed to the Palace Workshops in Beijing, and two other examples illustrated in B. Stevens, The Collector's Book of Chinese Snuff Bottles, no. 955 (on a yellow ground) and no. 960 (on a turquoise ground). For a Guyue Xuan-marked example on caramel-colored ground but attributed to Yangzhou, see one from the Blanche B. Exstein collection, sold in these rooms, 21 March 2002, lot 27, which bears a Guyue Xuan mark in red.